For casinos, digital signage not only provides the high-tech “wow factor” that today’s players and guests are looking for; it offers a powerful tool for delivering exceptional service. The result is an enhanced customer experience that builds brand loyalty and increases revenues. When evaluating digital signage options for a casino, there are several important factors to consider. The most important factor for a digital signage system is the display of the highest-possible quality content to attract and retain viewers. The fact is, with the proliferation of HDTV and high-resolution online graphics, today’s audience is very sophisticated and sensitive when it comes to the look and feel of content on screens. For a network to be successful, it needs to meet viewers’ high expectations. To offer the best service possible to players and guests, the digital signage solution should have the ability to target all screens in the casino as well as specific screens and even send SMS messages to individual mobile phones. For example, promotions for restaurants, amenities and events—in addition to emergency messaging—can be sent to all screens to maximize coverage. To greatly enhance the gaming experience, real-time alerts of current standings and scores can be displayed only at screens surrounding the gaming tables. For the ultimate in personalization, SMS messages can be sent to individual guests. An additional benefit of targeted messaging is that it enables effective and timely communication of information to employees. Whether it’s sent to the desktops of administrative staff or the mobile phones of staff members on the floor, as a corporate communications tool digital signage provides an easy way to keep employees up to date on company information, employee benefits, and security issues in a timely and entertaining fashion. Not only does interactive signage provide a more engaging experience for guests, it is a very convenient and useful way for them to receive information they need when they need it. Guests can interact with touchscreen displays to access information on hotel amenities, airline arrivals and departures, nearby attractions, the news, the weather forecast and much more. An interactive digital signage system also can play a crucial role in allowing guests to navigate a casino with an easy-to-read wayfinder map highlighting the route to their chosen attraction. It’s vital to keep content fresh. However, as many casinos place non-technical personnel in charge of this important task, tools for quick and easy updating are critical, such as simple, intuitive Web-based interfaces with point-and-click simplicity. For conferences and meetings, event data updating can also be completely automated through integration with hospitality software or other applications. For example, at the Hard Rock Hotel & Casino in Tulsa, Okla., X2O Media’s Xpresenter™ digital signage platform is integrated with Delphi hospitality software. Information from Delphi, such as event details, meeting room updates and other announcements, is automatically displayed on screens within the property. This means hotel event organizers don’t have to re-enter information, and important announcements, such as meeting room changes, don’t get lost in the shuffle. 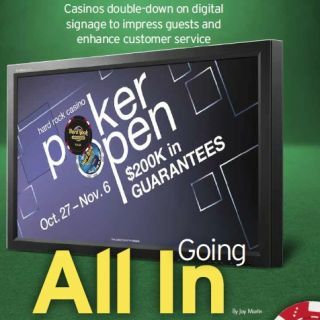 For casinos, there are numerous advantages to incorporating digital signage. Ultimately, it serves to increase the sense of well-being of guests and provides them with the utmost customer service; thus stimulating customer loyalty, which translates to repeat business, and that’s the name of the game.